Amsterdam, the Netherlands – The University of Texas MD Anderson Cancer Center, Elekta and Philips teams recently completed installation of the first high field (1.5 Tesla) MRI-guided linear accelerator in the United States. By early next year, the system will be operating in a non-clinical capacity. The MRI-guided linear accelerator (MR linac) is designed to capture highly detailed MR images of tumors and surrounding normal tissues as a patient receives radiotherapy. These images could then be used to adapt treatment delivery, increasing the accuracy of therapy and potentially improving treatment outcome. Development of the world’s first high field MR linac is the mission of the Elekta Atlantic Research Consortium headed by Elekta (NSE:EKTAb), which is working in collaboration with MRI technology partner, Royal Philips (NYSE: PHG; AEX: PHIA). 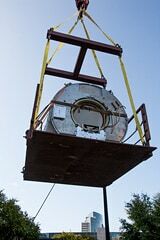 Earlier this year, MD Anderson Cancer Center renovated an existing radiotherapy vault. On August 1, Elekta began delivering and installing the system components. Elekta and Philips completed installation of the world’s first high field MRI-guided linear accelerator at University Medical Center Utrecht (Netherlands) at the end of 2014. Time zone: CET: Central European Time. Today, Elekta solutions in oncology and neurosurgery are used in over 6,000 hospitals worldwide. Elekta employs around 3,800 employees globally. The corporate headquarters is located in Stockholm, Sweden, and the company is listed on the Nordic Exchange under the ticker STO:EKTAB. Website: www.elekta.com. .